CharterLog includes a template-based reporting system which can be customized and extended to meet your reporting needs. And, when you are too busy to check the reports, the automatic Email Notification system will keep you on top of expiring Pilot currency items and checks/audit items. A companion iPad application is available. The App allows remote posting of flight information, and remote retrieval of selected reports and documents. 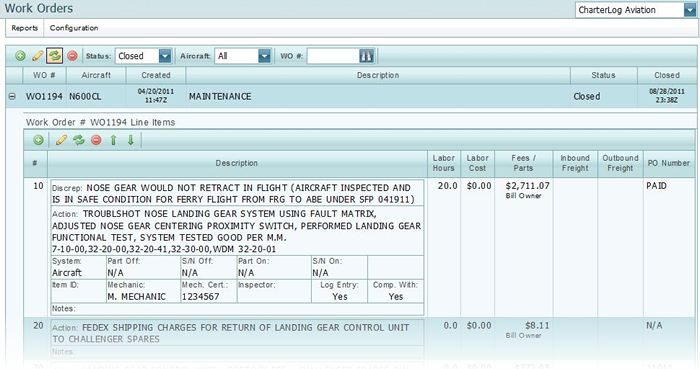 CharterLog XMS provides electronic storage and tracking of pilot certifications, currency items and related documents. In addition the integrated flight time and duty time logs record the information necessary for determining compliance with experience requirements and duty limitations. Any number of user-defined currency items can be tracked, including but not limited to: medical certificate due dates, various Part 135 checks (135.293, 135.297, 135.299), International Operations checks, and any FAR required checkrides and oral evaluations. CharterLog can be configured to send email notifications when pilot currency items are near due or past due. Pilot certificates, Medical certificates and other important training related certificates can be uploaded into the integrated Document manager, making them available to staff from any location with an internet connection. Document access is restricted such that a pilot can view only his or her own documents. The Pilot Reports library includes a host of standard reports like Currency Summary, Checks Due, and a graphical Flight & Duty report. Standard reports can be customized, and new reports can be added to meet your reporting requirements. CharterLog XMS provides electronic storage and tracking of critical aircraft information including the time and cycle counts for the airframe, engine(s) and APU. An automatic audit trail documents changes to these parameters. 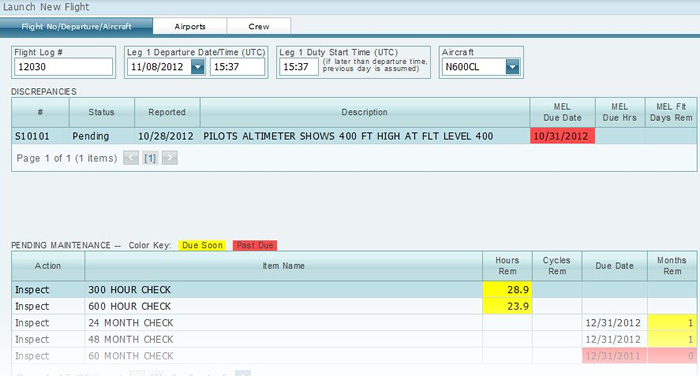 If the optional Flight Log module is used, CharterLog will automatically update the times and cycle counts when flights are posted. Any number of user-defined recurring maintenance items can be tracked. User-defined items can be defined to recur based on calendar date, hours, cycles or any combination of the three. Items based on hours and/or cycles are automatically updated when the time and cycles on the related aircraft or aircraft system (i.e. engine, APU, etc.) is updated. CharterLog XMS records and tracks Discrepancy reports, and includes support for deferred maintenance (MEL) items. Important aircraft documents and manuals can be uploaded into the integrated Document manager, making them available to staff from any location with an internet connection. Access can be granted or denied on an individual user basis. CharterLog's Work Order system provides electronic documentation of all your aircraft maintenance and inspection activities, and can generates tally sheets with task cards and log book entries. Each work order can have any number of line items which track serialized part numbers, labor and part costs fees, and both inbound and outbound freight costs. Line item labor costs are calculated based on user-defined rates. The labor costs for each line item can be earmarked for billing to the aircraft owner (retail rate), or as an internal cost (wholesale rate). Parts costs and Fees can be earmarked for billing to the aircraft owner, and can include a tiered-rate Parts Procurement Fee. Special “discrepancy” line items can be added, which include additional fields for recording the corrective action, part change information, mechanic name and certification, and inspector name. To save typing and reduce transcription errors, you can create new discrepancy line items by selecting from a pop-up list of pending discrepancy reports. The Work Order reports library include standard Master Log, Work Card and Logbook Entry report forms. These can be customized for your company, and new reports can be added as required. CharterLog includes a Document Library module capable of cataloging your important company documents. The supported document file formats include: Adobe (PDF), Microsoft Word (doc, docx, dot), and common image formats (jpg, bmp and gif). The Document Library catalog is organized into five major sections as follows. Aircraft Documents - Intended for aircraft-specific documents like Minimum Equipment Lists, etc. A sub-section is automatically created for each individual aircraft. Pilot Documents - Intended for personal pilot documents like licenses, certificates, passports, etc. A sub-section is automatically created for each individual pilot. Flight Bag Documents - Intended for forms, manuals and other documents useful to pilots and staff while "in the field." This section can optionally be divided into any number of user-defined sub-sections. Owner Documents - Typically used for documents of interest (contracts, insurance, accounting, etc.) to owners of the aircraft you manage. This section can optionally be divided into any number of user-defined sub-sections. FAA Documents - Typically used for documents you wish to make available to FAA personnell. This section can optionally be divided into any number of user-defined sub-sections. Documents files are uploaded to your private document directory where they can be organized into folders, moved, renamed and deleted. Once a document is uploaded, in can be added to the document catalog. A single document file can be referenced from more than one catalog entry. For example, a training manual can be referenced in both the Flight Bag section and the FAA section. The Flight Log streamlines the documentation of company flight operations by providing a single point of data entry for all relevant trip data. The module also provides for the recording of fuel purchase, fuel consumption and crew compensation information. New Flight records are created using Flight Launch Wizard which guides the user through the process of aircraft, route and crew selection. 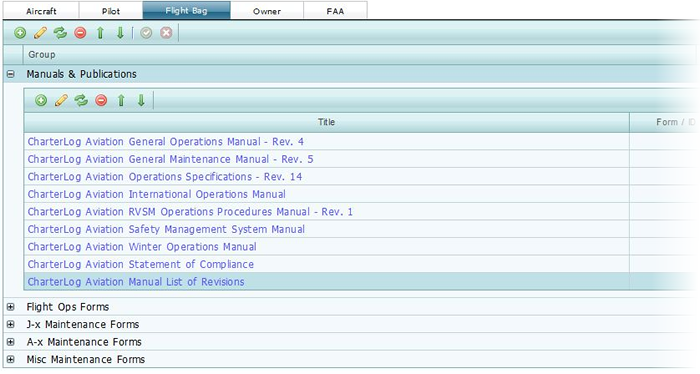 Relevant pilot currency and aircraft maintenance status information is displayed allowing these factors to be reviewed during the selection process. 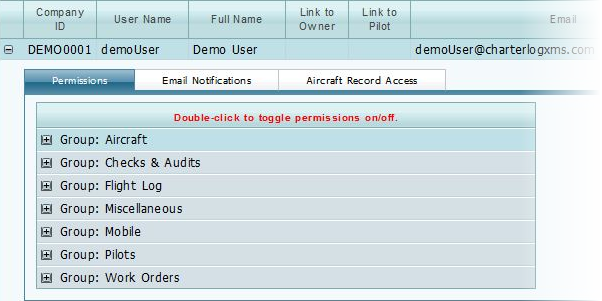 Once a Flight record has been completed, the “Close” functions posts updates to the appropriate records in the Pilot and Aircraft modules with a single mouse click. Support is included for calculation of pilot Trip Rig (per diem and meal and incidental expenses)for time away from the designated home base (domicile). You can assign a GSA-based hourly rate for each trip, or use the default GSA-based hourly rate stored in your company configuration settings. Scheduling metrics, including Estimate Departure/Arrival times, Scheduled Block time, and Passenger count. Aircraft metrics including Flight Time/Cycles, APU Hours, Fuel consumption, Oil (Engine and CSD) consumption. Crew experience metrics, including On/Off, Block, Night, IMC, Hold and Approach. Departure and Arrival information (Release, From, To, Out Off, On and In, Delay). Weight and Balance (T/O Weight, Landing Weight, Fwd./Aft CG Limits and Computed CG). Crew payment (Trip Rig) parameters. Many of the above parameters can be posted conveniently from the cockpit using the companion iPad application. In addition, if your aicraft is outfitted for ARINC position reporting, CharterLog can be configured to process ARINC "OFF" and "ON" email messages automatically every 15 minutes, and post Off/On times to the Flight Log. The Flight Reports library includes a variety of Flight Statistics, Fuel Consumption and Fuel Uplift reports, as well as Pilot Compensation (Trip RIG) report. Standard reports can be customized, and new reports can be added to meet your reporting requirements. You can configure CharterLog to send email notices when changes or additions are made to the database, or when a pilot currency item, audit or other recurring item is near due or past due. Discrepancy Notices - These are triggered when a new discrepancy is posted, or when an existing discrepancy is modified or marked as completed. The notices can be configured to include details on the information added or changed. Due Date Alerts - These notices are automatically generated on a daily basis. A notice is generated for items 90, 60 and 30 days prior to the due/expiration date, and also for any items which are past due or expired. Pilot Currency and Checks & Audit notices can be separately enabled. 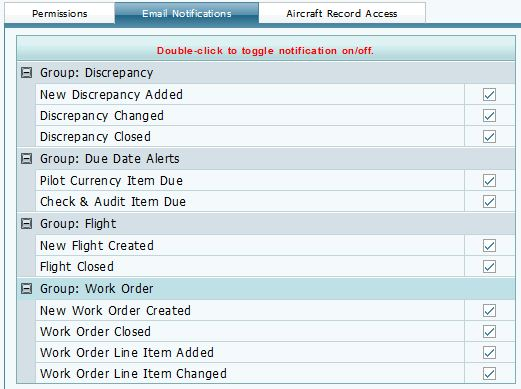 Flight Notices - These are triggered when a new Flight record is created or an existing record is closed. Notices can be configured to include details on the information added or changed. 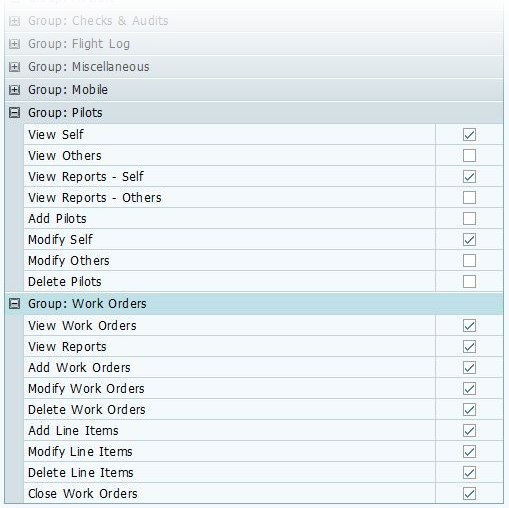 Work Order Notices - These are triggered when a new Work Order is created, a line-item is added or changed, or a work order is closed. Notices can be configured to include details on the information added or changed. CharterLog implements access control on two levels. First, before accessing any part of the system, a user must provide a valid username and password. CharterLog uses industry standard authentication mechanisms with totally private and encrypted passwords. In addition, CharterLog detects and prevents two (or more) users from logging in simultaneously with the same username, thus discouraging credential sharing, a common security vulnerability. Once a user is logged in, a detailed role-based permission system takes over and controls which modules the user can access, and what functions they can perform. Each user account has its own independent permission settings. Each module (e.g. Aircraft, Pilot, etc.) has a “view” permission which controls overall module access, and a “view reports” permission controlling access to the associated module reports. In addition, there are data-record-level “add”, “modify” and “delete” permissions for controlling the user’s activity within the module. Independent Aircraft Access settings allow you to show or hide individual aircraft at the user level. This is useful when you manage aircraft for multiple owners and want to make aircraft activity and maintenance information available without compromising information privacy between owners. 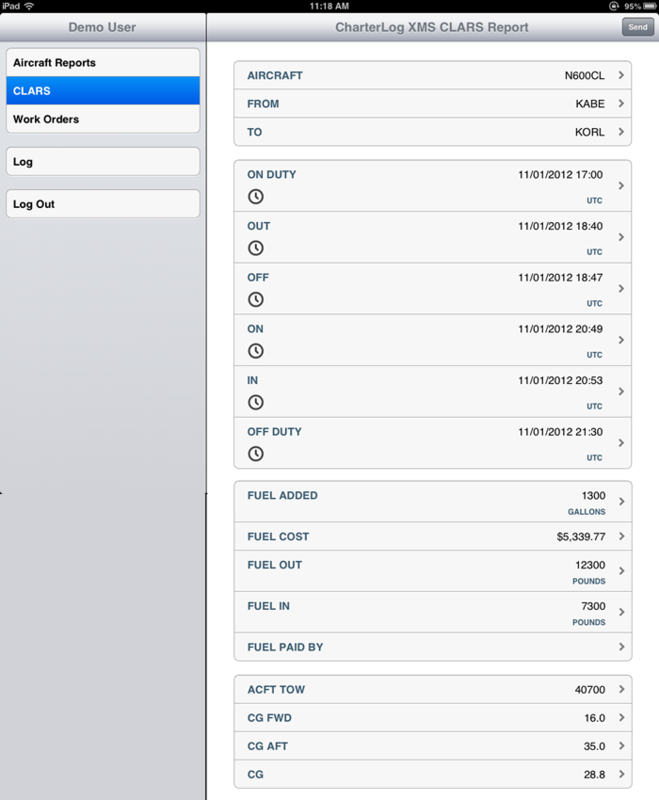 The companion iPad Application supports remote posting of flight information via the CharterLog Aviation Reporting Service (CLARS), which is part of the CharterLog Web Services API. The application is ideal for cockpit use, and can function in a disconnected state. Flight information postings are stored in the device until an internet connection becomes available. 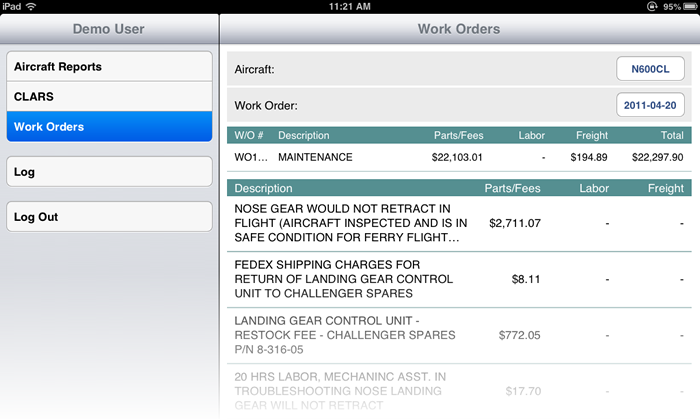 The iPad Application can also function as an mobile portal for viewing selected aircraft maintenance information and reports. Your aircraft management clients, and your pilots (to whom you have granted Mobile and Aircraft Access permissions), can view work order information, maintenance status reports, fuel uplift reports and trip reports. Support for document retrieval is slated for a future release. CharterLog Web Services (CWS) allows remote web and mobile applications to leverage the functionality of the CharterLog system. All service calls are protected from unauthorized use by a prerequisite log-in procedure. A valid CharterLog user name and password must be provided, and the user must have been granted specific permissions to call service functions. The CWS exposes the following services calls. Remote Reporting – Remote applications can request that selected reports be generated and delivered as PDF document files. At present, the available reports include aircraft fuel uplift, aircraft trip report, pending maintenance, pending discrepancies, deferred maintenance, and aircraft work order details. Flight Log Posting – A remote application can post departure/arrival times, fuel consumption, fuel purchase, weight & balance, and on/off duty times to the Flight Log via the CharterLog Aviation Reporting System (CLARS) service call. The CWS service calls make it easy to integrate CharterLog reports and documents into your company web site and create information portals for your staff and aircraft management clients. You can expose maintenance information, fuel uplift reports, and aircraft utilization reports for your client’s aircraft without granting them access to the CharterLog system. Polaris Microsystems can assist you with setting up a custom Web Portal and integrating it with your existing company site.